I hadn't used the Woodland Scenics Road Kit before. In the past my roads and streets have only been made with plaster, styrene or sand. 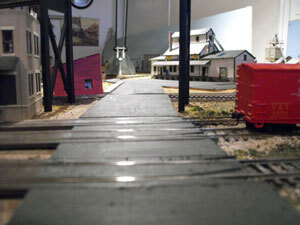 I decided to try something different for a group of streets around industrial buildings at Mintwood on my old Utopia Northern model railroad.This was a work in progress (January, 2012). 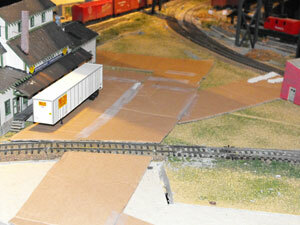 The first step was to lay out the streets using scrap cardboard until I got a configuration I liked. This included the parking areas at several factories. Using cardboard from boxes to lay out a template of streets. After doing this I opened the Woodland Scenics Road Kit and discovered that a nifty road measuring ruler was included. It gives typical 2-lane road widths in N, HO and O guage and the marking templates for sidewalks and parking. I found I could narrow some of the roads and leave out the sidewalk area that I didn't want to include on all portions. I recut some of the cardboard to change the pattern. This will give me more room to add some other buildings after the roads are completed. Another view of the road network taped templates around the buildings. I had to fill in some open areas in the benchwork with homasote. This will need to be covered with plaster cloth before I can make roads. The hardboard defines the pavement area. As the road must cross the tracks into Utopia the hardboard had to bring the street close to the railhead. The track is sitting on cork roadbed. I didn't have any plaster cloth on hand so I had to improvise. Before proceeding I stuffed some paper towel into the cracks between the scrap pieces of homasote I used to fill in the missing section of scenery. I could have used a piece of J-cloth or even some masking tape to keep the plaster from falling through the cracks. I layered on some spackling compound I had on hand on top of the paper towel in the cracks to prepare the scenery for additional ground cover and the roads. 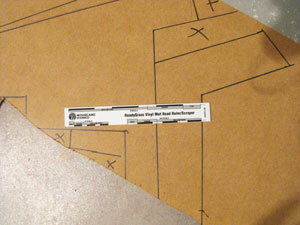 The next step was to cut out the hardboard to see how it fits the area. After that I will use the pavement and concrete paint that comes in the road kit to make roads. A fellow member of our NMR club, Gary Robinson, cut out the masonite on his band saw. This produced cleaner edges than I could have done with a sabre saw. Some pieces had to be shaped to fit, especially around the rails. I used a Zona model saw with fine teeth, a utility knife and a band sander to do the final shaping. The utility knife was used to shave off a few layers on the back of the masonite so the pieces would not foul wheels crossing the road. 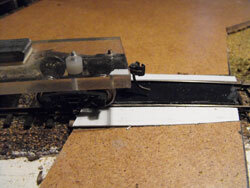 I used a piece of black styrene for one curved crossing. The masonite roads were cemented in place using a tube of "No More Nails" and weighted down with an assortment of weights. I smeared some wood filler on the joints. 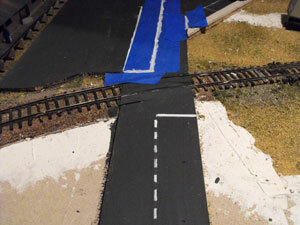 When everything was dry I sanded the joints and completed the rail crossings. One of them had to cross over a turnout near the frog. This took some extra tinkering. 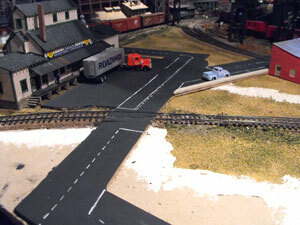 I used scrap styrene in various thicknesses to build up the road crossings. I used a test car from Micro Mark to check flange clearance. This car is basically a clear piece of acrylic so you can see what's happening as the wheels pass through the crossing. In some cases I cut pieces of masonite to fit up to the rails while in others I used styrene. As several of the roads crossed turnouts I had to be very careful to keep the styrene below the railheads and to shape the pieces to provide clearance for the wheel flanges. I secured them with Goo. The next step was to paint the roadways. It took three coats of the water-based asphalt paint that came in the kit to get adequate coverage. There was just enough paint in the jar to do the roads I had installed. For my previous attempts at building roads I had used a gray color. This is more blackish and looks more like wet roads or recently paved roads. I added some weathering before I finished. I had left one section of the road wider so I could install a sidewalk. The kit had a jar of concrete-colored paint. I cut a length of masonite about 7 scale feet wide and used a razor saw and a file to add expansion cracks every six feet. The road crossed two sidings and a turnout on the mainline. I had to fill in around the tracks. Previously I had installed rerailer tracks here and the road didn't line up correctly. I had to cut and fit little wedge-shaped pieces of styrene to fill some gaps. The bits of dirt needed to be removed before adding markings. So far, so good. The experiment in road making appeared to be working out OK. I had never tried putting on road markings. The road painters from Utopia need better tools and training! The first attempt at adding road markings didn't fare too well. The Woodland Scenics kit contains a metal pin that can be used. I had no success using it to paint lines. Maybe if it is used to scratch the surface to reveal white underneath it might work OK. I don't have white underneath the asphalt. The masonite is light brown.I reverted to using a small brush to paint the lines with Polly Scale white paint. That didn't work any better. It is very difficult to control the thickness of the lines even with a steady hand. Painter's masking tape lifted some of the asphalt paint. I stopped until I found a white paint pen to try. Scale Coat makes paint pens. I have a silver paint pen that I found in an artist's supply store but hadn't found a white paint pen yet. The other alternative was to use some kind of thin striping material. 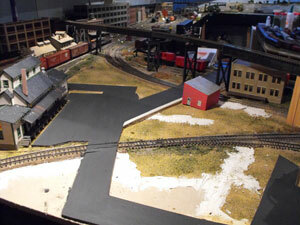 While digging around in Internet model railroad forums I saw that some modellers have had good success using roofing shingles to make roads. Interesting idea. Masking the roads for lines and using a light spray of white or yellow seems to be the preferred method. This took awhile to get resolved. I had plenty of other projects to occupy me until I could find a solution. We are all in the same boat. 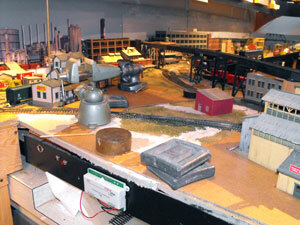 Always lots to do on a model railroad besides trying to make roads. I decided to try masking the lines. I figured the worst that could happen was I would have to repaint the asphalt. Masking with blue painter's tape certainly helps to give cleaner lines. Making good road markings is a challenge to be sure. I wasn't following any particular prototypical road markings.I only wanted something that looked plausible. The asphalt had dried for 24 hours so this time the paint didn't lift. I pressed down the edge of the tape with my fingernail. There was still some creepage under the edge of the tape. Because of the close quarters with the buildings I didn't try to spray paint.I used a small flat-tipped brush to touch up the lines I'd painted freehand and took up the tape after about 30 minutes. The lines are a little wide in spots but certainly looked better. 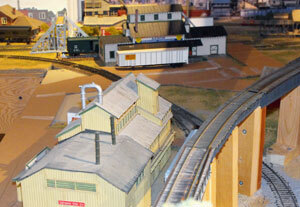 This whole area still needed a lot of work, including ballasting the track and adding other buildings. If you have a better idea how to make roads with cleaner line markings send me an email through my Contact page and I'll post your suggestions. 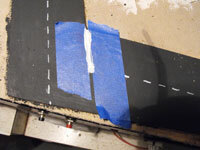 Other ideas and experiments in modeling roads. Return from how to "make-roads" to my Home Page. Do what I did. Build your own website with SBI. Are you a Word Press user? Now you can use SBI to help make Word Press earn you money. 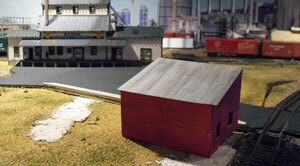 It's easy and can help pay for your model railroad. Even start your own career. Take a few minutes to see what others have done by clicking on the SBI advertisement above to learn how SBI integrates Word Press into a seamless, easy-to-use experience.